Jessica’s done it again. I think this girl is a Truffle Queen. She’s also the where I found the cookie dough truffles I know and love! These little gems are just as good. Seriously, how can you go wrong with sweet and salty in one little bite?! Jessica’s original recipe stated she got 20 truffles, each about the size of a teaspoon. I chose to double her recipe, and use my smallest cookie scoop (same size I make the chocolate chip dough truffles) and I got about 2.5 dozen. You can increase the amount as many times as you need to! – Combine peanut butter and pretzels in a small bowl. Chill in the freezer until firm, about 15 minutes. 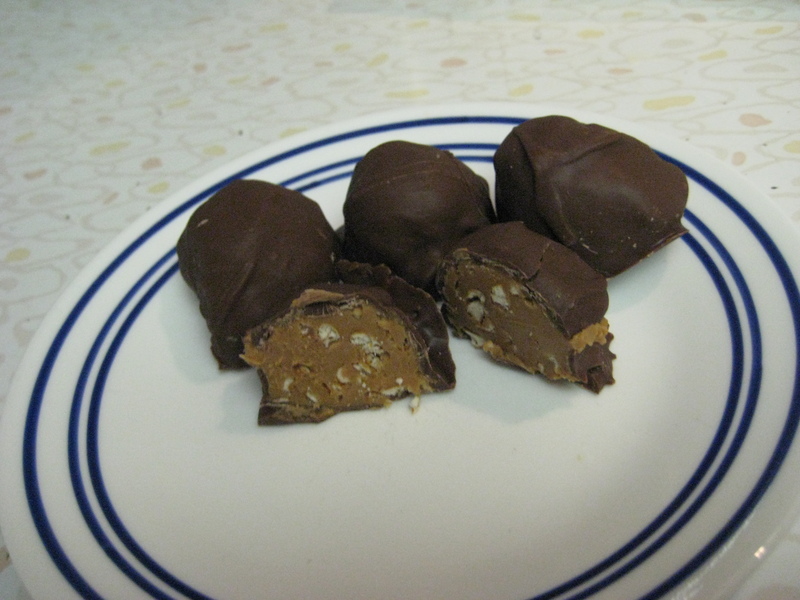 – Roll the peanut butter mixture into 20 balls (about 1 teaspoon each). – Place on a baking sheet lined with parchment or wax paper and freeze until very firm, about 1 hour. – Roll the frozen balls in melted chocolate. -Refrigerate until the chocolate is set, about 30 minutes. *I always keep my truffles in the freezer, and then just pull out what I need. I like them cold!